While I've only been a CDL instructor for about a week now, I've already noticed that my training techniques could easily go in several different directions. Just like it's stressful for a student driver, it's also stressful being a trainer! Dealing with that stress can cause certain reactions in different people and alter training techniques one way or another. Here are some of the more common personalities and traits a trainer might have, and how to deal with them as a student or new driver. This is probably the category that I fit into. I never raise my voice, I give instruction slowly, I let my student make mistakes, and I allow my student to get out of his comfort zone. Basically, as long as we don't hit anything or get ticketed, no big deal. Mistakes will be made, and sometimes the best way to learn is by making mistakes and learning from them. It's not that I don't care (I do) and it's not that I feel no stress (I DO! ), but I find this method works best to keep everyone calm and thinking clearly. This kind of a trainer is usually pretty easy to get along with and is difficult to rile up. Even if you make mistakes, the trainer's response will be "no big deal." Instead of grabbing onto the dashboard or smashing an imaginary brake pedal, the trainer will yawn and act like nothing is happening. This can help keep the student calm and less fearful of making mistakes or being yelled at. A trainer with a laid back attitude might seem like he doesn't care. The student probably won't get direct instruction and will be left to make their own decisions more often than they may have expected to. Students might feel as if they are being "thrown to the wolves" with this kind of training and will frequently seek out some guidance, but it won't be there. Students might also be expected to do things they feel they aren't ready to do alone, or would have at least preferred more instruction throughout the process. Be sure you are the one who initiates communication. If you feel uncomfortable about something, be specific about what you're uncomfortable with. If you want to verify that you did something correctly (or incorrectly), ask how you did. Ask what you could have done differently. If you feel you need additional guidance, try to be specific. For example, if you feel you need more practice on downshifting, let the trainer know. With this type of trainer, you need to take initiative. While you'll be granted plenty of freedom and independence, a set plan and specific goals to work towards may be lacking. And you may only hear instructions regarding a procedure once, so listen closely the first time. This type of trainer is gung-ho about their job. They have a very specific way of doing things and want it done their way. In many cases, they'll have an outlined plan and will tell you exactly what you need to be learning or working on in any given day or week. You can expect lots of direction, micro-management, and plenty of guidance from this kind of trainer. Most aggressive trainers have experience. They know what works and what doesn't. They've done it before and can provide very specific plans on what needs to be done in order for you to pass your training program. There will never be a question about what is expected of you and how you're doing when it comes to completing certain tasks. Expect to be micro-managed. These trainers often have a "one method fits all" mentality. The trainer might expect certain things from you even down to the smallest detail. You might have many different things to concentrate on all at the same time, and things might move at a pace you may not be comfortable with. Sometimes a student can feel as if the trainer is "nit picking" or on a power trip. Listen closely and follow instruction the best you can. Most aggressive trainers have specific goals they want you to reach within very specific time frames. While it's true there might be a lot of micro-managing and nit picking, their methods are often proven to work, which is why they are so set in their ways. This might provide an uncomfortable environment, but this is a temporary situation and if you do what the trainer asks, you'll probably learn at a quicker pace than with most other trainers. Leave your ego at home and simply do what is asked of you. This is a trainer who wears his emotions on his sleeve. If you do something to make him nervous, you'll know about it. This kind of a trainer may raise his voice and show emotion with body language such as grabbing onto the dashboard, taking your hand off the shifter, throwing his hands in the air, etc. The instant you do something wrong, you'll know about it. A very large aspect of truck driving is learning how to manage stress and think clearly under pressure. I'd even go as far as saying it is one of the top 3 things a new trucker should master. With this type of a trainer, you'll be forced to learn stress management skills. Not only will you be nervous while simply learning to drive the truck, but your trainer will make you a bit more nervous as well. On the surface, this seems bad. But remember, being with the trainer is a temporary situation. Learning how to manage your stress and think under pressure is a skill that will last you a lifetime and will certainly make you a better driver overall. This kind of a trainer may have trouble describing exactly what is making him nervous or exactly what he wants you to do (or stop doing). Communication breakdowns can occur. This will only increase the stress level for both the student and the trainer, which can lead to shouting matches and arguments, which leads to more stress and more shouting. Eventually, somebody has to stop the cycle. First, you must understand why the trainer is yelling. Usually the trainer isn't yelling because he is upset or angry; rather, it's a way for him to deal with the stress. Being in a truck with a new driver and having absolutely no physical control of the truck is a very frightening experience. Don't take the yelling and strong body language personally. Try to communicate as calm as you can and explain what it is you are doing or planning on doing. This will help reduce uncertainties and will prepare the trainer for what you are about to do. Sometimes, if the trainer is yelling, it's best to simply acknowledge the trainer and make note of the situation to discuss it later when emotions have cooled. It's an unfortunate reality, but there are some bad trainers are out there. Probably more than the industry would like to admit. If you're getting started in this industry, be aware of this fact. You might get placed with a great trainer and you might get placed with a terrible one. If you do get a bad one, there are certain steps you can take. But try as hard as you can to work through it and make it a great learning experience. Communication is key. Tell the trainer how you feel and why you feel that way. For example, you might need to tell a trainer, "I want to learn it your way, but I'm not understanding fully. What specifically am I doing wrong and how can I correct it?" Sometimes, a student might be placed with a trainer and they have conflicting personalities. The trainer is capable of doing a good job, focuses on safety, and truly does care about teaching properly. But sometimes personalities clash. In this scenario, try to get through it. Leave your ego outside the truck and just get through training. Once training is complete you'll never have to deal with that trainer again. Be the bigger person by showing patience, restraint, and a willingness to adapt to their lifestyle and personality. It's only temporary! In a worse case scenario, call dispatch or another point of contact and calmly explain the situation. Don't use this as a time to "bash" the trainer. Simply state that there are personality clashes and you're having trouble getting along. These trucking companies understand that not everyone can get along in such a tiny space. If you handle it in a calm, professional manner and recognize that the trainer simply isn't a good fit for you personally, they will most likely place you with another trainer without much trouble. But on rare occasions, a student will be placed with a dangerous or unsafe trainer. These are usually trainers who are in it solely for the money. If you are expected to do anything illegal, you need to take very specific steps to protect yourself. Document everything! Trucks at large companies are tracked by GPS and many companies use electronic logs. So make note of the times and places where illegal or unsafe practices occurred. Most likely, the company can go back to the date and time you specify to check on logs, truck speeds, RPM's, and all sorts of data (you'd be shocked about how much information they can obtain). Call a dispatcher or another point of contact and give them specific information. Don't simply say "my trainer is dangerous and expects me to do illegal things." Tell them exactly what dangerous activity was performed or what illegal things are taking place. Many students are afraid to report dangerous or unsafe activity, so if it's gone unreported for quite some time, it might not be noticed at all by the company. Until somebody reports it, the company has no way of knowing it's occurring. There seems to be a rumor circling the internet that trucking companies who operate their own CDL training programs because CDL training">Company-sponsored CDL training programs are profitable. This is a false rumor. 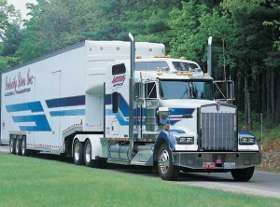 Companies do not make money until you become a full time solo driver for them, and stay onboard for about one full year. When they train their students, they want their graduates to remain with the company as long as possible and for them to be safe and courteous drivers. So while you're expected to make some sacrifices and adapt to a trainer's personality or training style, you should never be expected to do anything illegal or unsafe. Just try to understand where your trainer is coming from. It's a stressful experience for the both of you. Each individual will deal with that stress differently. But everyone, from the CEO of the trucking company all the way down to your trainer, wants you to succeed! As a trainer myself, I would like nothing more than to see my student pass everything on the first attempt and become a safe, profitable, happy, professional driver. So even though my "laid back" style of training might make it seem as though I don't care, it's my way of dealing with the stress and I truly have the student's best interest in mind. Most trainers care about your success. So get out there, get through your training, and before you know it, you'll be driving your own truck down the highway and calling all the shots. Good luck, and as always, drive safely!